The past week has seen two incidents involving soldiers and Palestinians causing the IDF much embarrassment. An initial investigation of an incident in the West Bank last Friday in which IDF soldiers were forced to flee a mob of stone-throwing Palestinians suggests that the troops did not act in a professional manner. An IDF inquiry conducted by officers in the Judea and Samaria Division determined that the soldiers should have demonstrated resolve instead of retreating. A video that surfaced over the weekend shows Palestinians stoning Israeli security forces, eventually forcing them to run for cover - similiar to the incident in Hebron. Six IDF soldiers equipped with shields and crowd-dispersal means found themselves ambushed by a crowd of stone throwing Palestinians in the West Bank village of Kafr Qaddum. The combatants tried to hide behind a wall but soon came under a barrage of stones and decided to escape the scene with the protesters chasing after them, throwing stones at them and calling "Allahu Akbar." S., a soldier serving in the Hebron sector, says that the troops' hands are effectively tied. "The orders we are given for situations such as this are just vague, and we all feel that this is intentional," he says. "More than anything the images humiliate us as combatants who are supposed to carry out much more complex missions. We have no ability to handle a group of protesters because our hands are simply tied. It's not that we're not trained to handle these protests. We need to be given tools." According to S., orders to open fire address situations of a clear and present danger and only if there is a person with the means and intent to kill. "But what is an angry mob throwing stones and sometimes rocks at you if not a life threatening situation? I wouldn't order opening fire at a crowd of people but we can't have a situation where you stand in front of a person with a rock and start to ask yourself is this person life threatening. If I shoot at him I go to jail." T., a combatant in an infantry brigade, also claims that soldiers are not equipped to handle the complex situation on the ground. "There's nothing more humiliating for a combatant than to see his friends run," he says. He criticizes the army for sending such a small group of soldiers to Qaddum on Friday at a particularly volatile time. T. says the cameras on the ground undermine the forces' efforts. "A commander or an officer sees a camera and becomes a diplomat, calculating every rubber bullet, every step. It's intolerable, we're left utterly exposed. The cameras are our kryptonite." IDF forces are trained not to get dragged into protesters' provocations and instead demonstrate resolve. 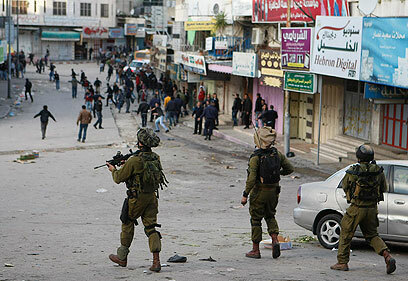 In preparation for possible West Bank riots in September 2011, IDF Chief of Staff Benny Gantz instructed the army to place senior commanders at the head of patrols. The IDF is now checking whether a junior commander had made the decision to flee the scene in Kafr Qaddum. The IDF Spokesperson's Unit said in response, "The event documented in the video is being investigated by the top commanders in the field. "The incident occurred during a violent and illegal riot in Qaddum - one of the most violent areas in the Judea and Samaria district. The IDF updated its crowd-dispersal guidelines following the event." See all talkbacks "Soldiers: Our hands are being tied"